Tonight I'm drinking Jubelale brewed by Deschutes Brewery in Bend, Oregon. These beers are not available in Florida... unless, that is, you have awesome friends like Christina Moore. She sent me a few pictures of her beer drinking experience during her vacation in Oregon last week, then went out of her way to send me a "care package". Four of those beers are brewed by Deschutes, and I decided to start with Jubelale, "A Festive Winter Ale" because Winter just ended yesterday and this beer is Best By 03/23/11, which I am under the gun to make. The label art done by Natasha Bacca is festive and colorful, with what I interpret to be a blazing fire and a party atmosphere around it. Before I get to the beer, if you are a dog lover of any sort, you should visit Christina's website. She is a breeder of Cane Corsos, which are huge Italian Mastiffs. There are lots of pictures of some beautiful dogs. I had dogs growing up my whole life, but despite gently nudging my wife, I've never been able to bring one home. Not sure a Cane Corso would be in our future anyway, as it appears to be a breed that takes a family and environment different than what we have to offer. 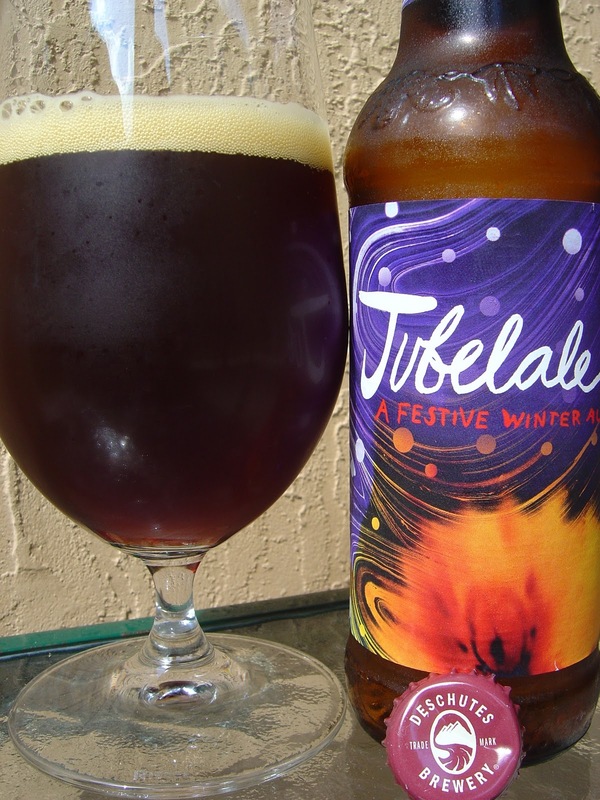 Jubelale has a sweet malty aroma. Caramel along with raisins and plums and all kinds of dark fruity goodness. Fruity sweet raisin start, but escorted immediately by a just tardy hoppy bitter bite. The 6.7% alcohol is noticeable throughout, and is a warmer, but just that. Nothing harsh. Chocolate and molasses flavors work nicely with the fruity beginning, and some black pepper and cinnamon are there to spice things up as well. Again with the balancing answer, some bitter orange rind makes itself available sip after sip. Well balanced, more of a seesaw than a blend, and a pretty nice beer. Hi Christina. You didn't think I was not going to mention you or some of your interests, did you? I'm pretty sure that's how we met anyway, and I've checked out some puppy pics here and there. :) Thank you. Hey Sean. Well, Jubelale was good for me, but I will admit that the style is not a favorite of mine. Something about the spicy flavors and contrast, perhaps. But you know what? There are two Black Butte Porters and one Mirror Pond. The other two are from different brewers. Looking forward to all of them!